There’s a royal event this weekend, apparently, but it was the Royal family of blues-rock who stormed The Live Rooms, Chester last night. King King – so good, they named them twice- and their special Canadian, one man blues rock band guest Steve Hill set the place alight and rocked it to its foundations. Steve Hill has a new live album out, One Man Blues Rock Band, but to truly appreciate the twenty-five-year-in-the-making-overnight-success-story then there’s nothing like seeing him in the flesh. All raw energy, long hair swishing around like a curtain and denim jacket shaun at the arms, Hill takes to the stage and makes it his own. Rhythm All Over is the opener and things barely look back. His barbed vocals sear the night, whilst his immaculate playing – both of guitar and the myriad of kick drums and cymbals – causes jaws to audibly drop. Not even one or two technical issues with the cymbals can throw him off kilter, it seems. The Ballad of Johnny Wabo is a monolithic tale that starts off slow then ignites into a powerhouse, a full throttle rocker of the most exquisite kind. Dangerous is an ode to an ex-love that sends the spine into juddering spasms whereas Hill‘s closing rendition of Voodoo Chile is quite simply astonishingly awesome. If ever there’s a man to set the scene, Steve Hill is that man and the raucous appreciation his 40 minute set receives on its conclusion is testament to his ever-soaring rise in popularity. Should you miss him this time around, make sure you check out the tour dates later in the year when he’s back headlining his own tour. There’s a lot to be said for venues. 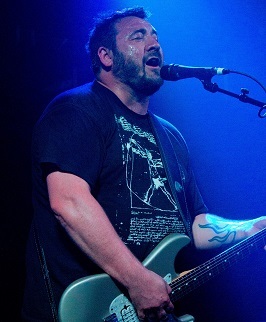 Last week King King played the all seated Epstein Theatre in Liverpool. As brilliant as they were, tonight in Chester they appear more energised, more ‘on it’ and a damn sight more up for the night. In short: King King – right here, right now – are on fire! The Live Rooms really is a venue that’s tailor made for rock with its low ceilings, hemmed in space and crystal acoustics. A fitting auditorium for this most energised of bands. If only those intent on talking could shut up a minute and actually show a little respect for those around them … and the band on stage! It’s a gig, not a nightclub!! Kicking off with (She Don’t) Gimme No Lovin’, the first single from their latest album Exile & Grace, Alan Nimmo rips up the How To manual of how to entertain and proceeds to set the bar ever higher. Wakin’ Up is a cool, true-blues masterpiece, whereas deference is paid to brother Stevie with a majestic version of You Stop the Rain. Nothing is left in the locker, with bandmates Lindsay Coulson on bass, Wayne Proctor on drums and a mercurial Jonny Dyke – who’s family are in the audience, just to add a little spice during his playing of A Long History of Love – stretching their respective machines to their very outer limits. The packed audience lap up every note so that as the musicians raise the temperature of their playing, so does the atmosphere fairly crackle with combustibility. The mix of old and new continues apace. Long Time Runnin’ is destined to be legendary in the years to come, whereas Rush Hour already is. Nimmo’s slick control of playing provides the backdrop, but on this song more possibly than any other, it is the clarity and sheer power of his vocals that mesmerise. Yet it is the regal Stranger to Love – replete with its astonishing and duly recognised solo – that is the standout song of the set. It’s biting, heart-wrenching lyrics, combined with some of the most magical of chords to have been hewn from a guitar, Nimmo fairly revels in the spotlight (when it can keep up with him) and infuses the whole thing with such passion, it is impossible not to spontaneously combust into applause at its climax. Closing on the ever upbeat Let Love In, King King depart The Chester Live Rooms stage safe in the knowledge that another audience have been royally conquered and that their reputation as being ‘the best around right now’ is safely assured.